Nectarines are nearly identical to peaches in both their genetic makeup and nutritional profile. The most obvious differences are their skin and flavor. Peaches are covered with fuzz, while nectarines have a thin, smooth skin. Nectarines also have slightly firmer flesh and a more sweet-tart flavor. Although their flavors are distinctive, nectarines and peaches can often be interchanged in recipes. Nectarines are either freestone or clingstone. Freestone nectarines have pits that are easily removed and are commonly eaten out of hand. Clingstone nectarines have pits that are harder to remove and are better used for cooking and canning since they hold their shape better. Nectarines are best in the summer, with the peak season occurring between July and August. Canned and frozen nectarines are available all year long. In addition to being low in calories and rich in fiber, nectarines are a good source of vitamin A, vitamin C, and potassium. These nutrients offer significant health benefits in terms of improved metabolism, digestion, and heart health. Nectarines (scientific name P. persica var. nucipersica) is believed to have been cultivated as far back as 4,000 years ago. Like peaches, nectarines have long been used in folk remedies for colic and stomach aches or in Chinese traditional medicine to treat constipation and menstrual pain. One medium nectarine has 14 grams of carbohydrates, making it suitable for most low-carb diets. With that being said, during phase 1 of the South Beach Diet and the induction phase of the Atkins Diet, fruits of all types are banned since the daily carb intake would be limited to no more than 22 grams. Many of the carbs in nectarines come from simple carbs, namely sugar. In nectarines, fructose accounts for more than a third of the simple sugars; the rest is made up of glucose and sucrose. As opposed to complex carbs that are gradually broken down into simple sugars, simple carbs are burned quickly and can potentially influence your blood sugar. Despite the sugar content, nectarines have a relatively modest glycemic index (GI). This is the value that describes how much a portion of food affects blood sugar on a scale of 0 (low) to 100 (high). Nectarines clock with at a relatively modest GI of 43, more or less in line with a cup of unsweetened bran cereal or one slice of cracked wheat bread. Anything below 55 is considered low. This doesn't mean that you can eat all the nectarines you want, particularly if you are diabetic. It simply suggests that you can include them a part of a diabetes-friendly diet. Nectarines also deliver 2.2 grams of fiber per serving, about 8 percent of the 25 grams that women need each day and 6 percent of the 38 grams that men need on a daily basis. Nectarines are a low-fat food with less than a half gram of fat per serving and no cholesterol. The small amount of fat in nectarines in comprised of heart-healthy monounsaturated and polyunsaturated fats. Nectarines are not an especially rich source of protein, delivering just 1.5 grams per serving. To boost the protein content, pair nectarine with a slice of prosciutto (9 grams of protein) and a 1-ounce serving of crumbled feta cheese (4 grams of protein). Nectarines also offer a significant amount of the antioxidants beta-carotene, a precursor to vitamin A, and tryptophan, a precursor to niacin. Compared to peaches, nectarines have more plant-based polyphenols, which naturopaths believe have distinct medicinal properties. Beyond their nutritional value, nectarines are believed to offer health benefits either by preventing or reducing the risk of obesity, diabetes, and heart disease. According to a 2007 study from Texas A&M University, nectarines contain potent polyphenol compounds that can potentially reverse symptoms of metabolic syndrome while simultaneously lowering blood sugar and reducing vascular inflammation associated with atherosclerosis (hardening of the arteries). The research suggests that four polyphenolic groups—anthocyanins, chlorogenic acids, quercetin derivatives, and catechins—act on different cell lines, including fat cells, endothelial cells in blood vessels, and macrophage cells that participate in the inflammatory response. Working in complement, the polyphenol compounds are believed to moderate blood sugar level, reduce the risk of cardiovascular disease, and prevent the accumulation of adipose cells around organs. The same team of researchers reported, in a 2009 study, that the same polyphenols reduced the proliferation of estrogen-independent breast cancer cells in test tubes by 50 percent. This suggests that peach and nectarine polyphenols may offer a protective benefit against certain breast cancers. Vitamin A, vitamin C, beta-carotene, and tryptophan have similar properties. These antioxidant compounds not only help lower vascular inflammation, improving circulation and blood pressure but can also prevent the oxidation of low-density lipoprotein (LDL) cholesterol, the type associated with atherosclerosis and coronary artery disease. Despite these potential benefits, there have been few human studies investigating the direct dietary impact of nectarines on any of these conditions. Are organic nectarines better than non-organic ones? Like peaches, nectarines are on the so-called "dirty dozen" list. This is the list of produce that tends to have higher pesticide residue. When possible, it is best to buy organic nectarines. Beyond safety, organic fruits are generally allowed to ripen longer on the tree or vine, increasing their sugar concentration. If cost is an issue, non-organic nectarines are fine; just make sure to wash them thoroughly. Frozen nectarines can be used for recipes and usually maintain most of their nutritional value. If purchasing canned nectarines, be sure to choose those that are packed in their own juices and do not have any added sugar. How do I know if a nectarine is ripe? When shopping, make sure to smell the nectarines. Choose those that have a good aroma and are free of blemishes, bruises, soft spots, and wrinkles. The skin should be a creamy yellow to an orange-yellow and have a matte sheen. Contrary to what most people believe, red patches do not indicate ripeness. However, if you find a green-skinned nectarine, that means it was picked too early and will not ripen any further. Nectarines will soften over time, but, once they are picked, they will not become sweeter. Nectarines picked at their prime will continue to ripen at room temperature. You can speed the process by putting them in a paper bag. This is because a hormone known at ethylene will be emitted as the fruit ripens and act as a ripening agent if confined to a small container. You can store nectarines in the refrigerator to keep them from getting overly ripe, but they're tastiest and juiciest if eaten at room temperature. If you aren't able to eat your nectarines before they over-ripen, wash them, remove the pit, cut them into slices, and freeze in a freezer bag. How do I pit a clingstone nectarine? Clingstone nectarines have a large pit (stone) in the center that is hard to remove. To extract the stone easily, wash the nectarine and dry it with a paper towel. Place the nectarine on a cutting board, making a deep cut along the center seam of the fruit and continuing all around the stone. Next, twist the cut nectarine in opposite directions so that you have two halves. If this doesn't work, make another cut from stem to tip so that you have four equal, quartered portions. Shimmy the knife in the stone to gradually loosen each quarter. If a section is not easily removed, work a small paring knife or spoon around the stone until the fruit is free. Nectarines are great eaten by themselves or paired with a handful of nuts or seeds. Nectarines are also a wonderful addition to salads, pancakes, Greek yogurt, cottage cheese, ice cream, and hot cereals. You can dice them finely and mix them with cilantro, lime juice, diced red onion, and sweet chili sauce for delicious fruity salsa. Thet can also be pureed for smoothies or gently cooked and pureed for an unsweetened dessert topping. A true allergy to nectarine is not as common as to other foods. With that being said, cross-reactive symptoms may develop soon after eating nectarines due to a phenomenon known as oral allergy syndrome (OAS). This is when the immune system mistakes certain foods for tree or grass pollens that cause "true" allergies. According to the American College of Allergy, Asthma, and Immunology, the two pollens most commonly associated with nectarine OAS are birch pollen (from the end of April to early-July) and grass pollen (from May to early-July). Because the symptoms usually subside once the fruit is swallowed, treatment is usually not needed. Longer lasting symptoms may benefit from an over-the-counter oral antihistamine. Call your doctor or seek urgent care if the symptoms persist or worsen. In rare instances, a potentially life-threatening, all-body allergy known as anaphylaxis has been known to occur (most often, in older adults with a long history of peach or nectarine allergies). If left untreated, anaphylaxis can lead to coma, shock, asphyxiation, heart or respiratory failure, and death. You can avoid OAS symptoms by cooking the nectarines. This breaks down the proteins the immune system abnormally reacts to. OAS usually affects older children, teens, and young adults who have eaten nectarines before and never had a problem. It is only after developing perennial allergic rhinitis (hay fever) that OAS symptoms will begin to appear. There are no known drug interactions to nectarines. 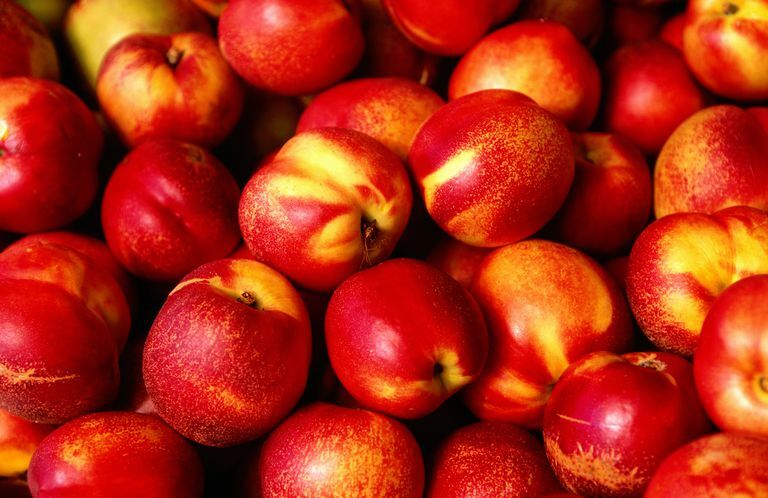 However, nectarines may need to be avoided in people with potassium-restricted diets, especially those on Aldactone (spironolactone), a potassium-sparing diuretic. Potassium-restricted diets are often prescribed for people with chronic kidney disease (CKD). Eating potassium-rich foods like nectarines with Aldactone may cause a potentially serious accumulation of potassium (known as hyperkalemia) in people with CKD. American College of Allergy, Asthma, and Immunology (ACAAI). Oral Allergy Syndrome. Arlington Heights, Illinois: ACAAI; updated 2014. Noratto, G.; Porter, W.; Byrne, D. Identifying peach and plum polyphenols with chemopreventive potential against estrogen-independent breast cancer cells. J Agric Food Chem. 2009;57(12):5219-26. DOI: 10.1021/jf900259m. Vizzotto, M.; Cisnero-Zevallos, L.; Byrne, D. et al. Large Variation Found in the Phytochemical and Antioxidant Activity of Peach and Plum Germplasm. JASHS. 2007;132:3334-340.